Sports Injury Rehabilitation helps athletes effectively rehabilitate themselves from pain and return to normal function. We emphasize on education of early injury recognition and ways to prevent injury and how to treat once injury occurred. Specific strengthening and flexibility exercises will be implemented in conjunction with receiving a course of treatment. The injury site returns to a fully functional state once progressive exercises are included in rehabilitation programmes. Our therapists team provides care that is unsurpassed and differs individual to individual. We closely communicate with all involved parties (referring physician, etc.) on the progress of each individual. Sports Injury Rehabilitation treats a range of conditions including acute sports injuries, strains, sprains, muscle, tendon and ligament repairs, tendonitis, hand injuries, shoulder dislocation, foot or ankle dysfunction and surgery rehab. Specific goals such as mobility, flexibility training, coordination of balance and joint positioning are targeted through exercises. As progress is made, the athlete and trainer can work together towards re-establishing strength. Sports/Activity specific exercises and training. Bracing and taping (athletic and kinesiotaping). 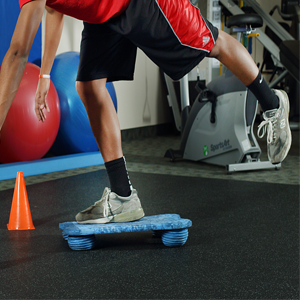 Sports Injury Rehabilitation helps you return to the activities as quickly with safety as possible. We provide state-of-the-art clinical care for athletes of all ages and skill levels. Although your body part is injured, you can stay in shape by using this as an opportunity to strengthen other areas of the body. A personal, committed investment in healing is a strategy that will help you regain optimal performance.